I search informations about medieval composite bows (for crossbow) : compositions, dimension (length, deepth of different materials...), draw strengh and other interesting/historical things. I'm making test for a personal crossbow (60cm long) and I'm always at very high strength and finally break at final draw length because of it. what I see on old crossbows pictures (XV-XVI th century) looks like 3-4 cm deepth and seems very strong. things I read about this always speak about composite bows, but with that strength, I wonder if that's not several laminations not glued together. European composite prods were composed of one or two layers of certain woods, a layer of buffalo horn on the belly and layers of sinew on the back, all glued together with fish bladder glue (not hide glue) and then the entire prod was wrapped in bark, silk or thin leather and varnished to protect the prod from moisture. The Chinese used "loose laminate" prods which were several layers of bamboo, and which were not glued together. The laminations were like leaf springs on a car, held together by bands but allowed to slide with each other. The prod pictured in my avatar is a modern version of a loose laminate prod, using sold fiberglass bars to make a powerful prod. For information on the techniques of building composite bows and loose laminate Chinese prods, I can direct you to www.ATARN.net The Asian Traditional Archery Research Network is a group of people dedicated to recreating the kinds of bows used in many different places and times throughout Asia. They also have a Facebook page which is very active. Look at the composite bows built by people like Jason Beever, Beaumont Vance, and Jack Farrell, modern master of these ancient techniques. This site has a lot of great info on horn composite prods, search posts by 'Mac', in particular, for a bunch of good stuff. Hornbow bellies were complex assemblages, a hundred or more little slivers of horn toothed, glued together, then sinew-backed in multiple layers. Tons of work, and I don't doubt it took even an expert a year or more to finish one. I actually think even higher weights are possible with wood/sinew composites, the deliberate deflex and short draw length keep the stress levels (relatively) low. I'd be willing to bet that a thicker, wider version of the above, maybe 35" long, could be made to produce 250#, or maybe even more. Sinew backing wooden bows is pretty low-tech and achievable, too (I do all mine on the kitchen table )...I encourage you to continue your experiments. Nice job on that osage/sine bow, Orien. All of the hornbows that I know of being built do not use "a hundred or more little slivers" of horn. An average Mongol or Hun or Avar bow uses only 3-5 slices of horn on the belly, each one 6"-12" long, depending on the curves. My friend Jason Beever builds Scythian replicas, the most curvaceous of bows, and I don't think he uses more than 8 pieces of horn on a belly. I stand by my "little slivers" remark, though; traditional practice for making horn-sinew prods was different than that for handheld archery bows (which do use full-length strips). Check out the original horn belly shown in this post :http://thearbalistguild.forumotion.com/t96p25-making-horn-and-sinew-prods Other pics I've seen of cross-cut composite prods appear to show the same, little horn strips/slivers glued up, sometimes with a wooden core, or in double layers, then heavily sinew-backed. 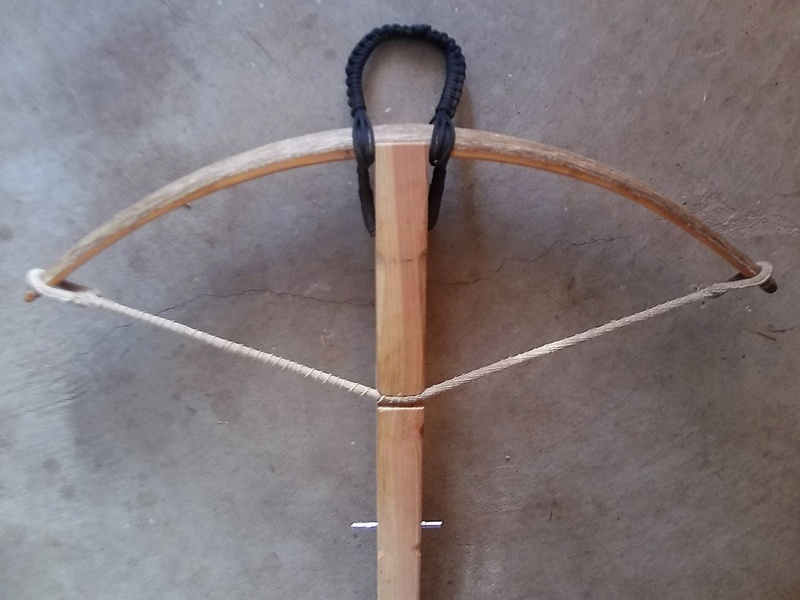 In any case, personally I haven't made any kind of horn-bellied bows at all, yet ...only a few simple composite archery bows, and couple wood/sinew crossbow prods of moderate (sub-200#) draw weight. Hello, sorry to reply a bit late. and thanks for your reply. Yes, Kenh, for the few I know, composite european bow for crossbow are real composites when chinese ones aren't glued. I must confess I made several breaking test with artificial horn (because natural one is very expensive to use in order to break, but artifical horn break easier). All 60cm long. then I glued the 6mm artif. horn on the 6-7mm bamboo and it break near the draw length. So I then tried 4mm horn+ 6mm bamboo which makes about a 80lbs bow (which finally break when I stress it for several minutes). Here are my tests. I have to put sinew backing to stop breaking them (but that's so long that I prefer breaking on my test than puting sinew). But my thought was that a 10mm (1cm) thick bow already make 80lbs bow... but when I see very thick bows on pictures (more than 2.5cm - 1"), I wonder what could be the draw strengh of them (we consider the bow is 8x more strong when you double the thickness). And I'm not sure this could work without breaking. Orien, you made a nice work. Backing bows are sometime easier to make (but especially less expensive). gluing horn isn't so hard with modern glues (I use titebond III). But horn is really stronger than wood (even Osage) so with the same thickness you'll have maybe a 2x stronger bow. I don't use osage as it doesn't grow in Europe (except in my garden but it's only 2years old!). But I'm not sure it could go more than 200-250lbs except with deflex but you loose a lot of speed to the bolt. For composite bows, some countries has traditionnally used small horns glued together (maybe because the animals didn't have long horns) but most of them are made with only 2 horns (1 for each limb). Now you can find horn plate and you'll need maybe 15-20 euros to make a bow with 8-10 plates. but if you when 2 long horns, you'll have more work to put the correct shape and it will cost about 100 euros (but less risks to break). For testing. How would ipe go on the belly and bamboo on the outside? I think he's learning and I've seen long-arc flexing arcs made with these materials and they seem to work very well. I'm sorry to relive an old subject, but since I'm wanting to acquire knowledge ..
Ipe + bamboo ... I don't know at all. that's more laminated bows than composite ones, and I have absolutely no experience in laminated bows. That's less flexible than horn and sinew for sure (you can't make ring shape korean bows with bamboo and ipe, but you can make good ones). Bamboo is often used on back but I think there is a lot of different kind of bamboo. Thanks for your answer, I've seen the natural and in youtube, long bows made in that way, I thought I could make a bow for crossbow in the same way and escape the risk of steel, at least for the moment. Thank you Mr. Kenh, I will use ash that I have too.